The first item on the list pertains to the Triangle Motel in Amarillo. Bob “Croc” Lile of that fair city has initiated a small fund raiser to assist in the purchase and renovation of this historic Route 66 facility. Joining him in this endeavor is Dale Butel of Route 66 Tours in Australia. With that type of endorsement I knew this had to be a worthy cause. So, the last prints in the first of the Ghost Towns of the Southwest and Route 66 icons series, signed, matted and numbered, are currently at the Lile Fine Art Gallery in the Sunset Galleries in Amarillo (contact information is found in the tab at the top of the page pertaining to photos or you can send me an email). I will donate the entire proceeds from the sale of these prints, minus gallery commission, to this endeavor. I can not promise the prints will be a better investment than Elvis collector plates, which are probably a better gamble than stocks. Still, these prints will really dress up a home or office and have been sold to international collectors. So, here is your chance to help preserve a piece of Route 66 history, cover up that blank spot or hole in the wall, and perhaps make an investment. Next on the list is the forthcoming Route 66 anniversary celebration on Santa Monica Pier scheduled for the 11th of November. My attendance is still in limbo but it looks as though this will be a great party. There has been some legitimate concerns expressed that the event will only add to the myth that Route 66 ended at Palisades Park overlooking the pier. Well, in talking with the organizer, Dan Rice, this afternoon I really do not see that happening if he has anything to do with it. quite well as he has the dates and places pertaining to the various endings for Route 66 memorized. Of course for memorization it always helps to repeat the lesson and Dan does so at least a few dozen times a day as he talks to visitors from his kiosk shop on the pier. I fell behind with the encyclopedia this weekend. In reviewing my original schedule it would seem I am now about three weeks behind, not good but rather common so panic has not set in as yet. The only excuse I could muster was the unusually warm weather and being tired. Still, I managed to crank out around 1,500 words on this project, complete material needed for possible consideration of the syndication by King Features of a travel feature, take a long walk with my dearest friend, made a few dozen phone calls, received some good news from the publisher pertaining to photo samples submitted, took care of a few items at the office via phone, and had time for a very pleasant evening with Chris Durkin, his wife Daylene, my son, and his girlfriend. I also manged to squeeze in a movie night with my wife. So, I would say it was a well balanced and somewhat productive weekend. For a bit of relaxation after a day of writing, I again turned to my photo project, taking somewhat decent, normal photos and giving them a Frankenstein treatment. The goal is to find something suitable for a new series to accompany the release of Ghost Towns of Route 66 next June. I haven’t found the right combination yet, the one that leaves no doubt that the curtain between the past and present is more of a very thin veil in these places. Still, it seems to be a harmless recreational endeavor that provides a bit of recreation and inspires new thoughts on old subjects. 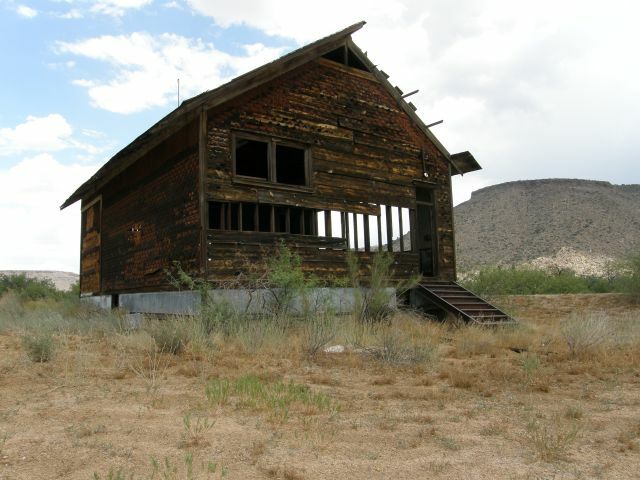 This particular photo is of the old school on the south side of Route 66 and the railroad tracks at the west end of Truxton Canyon. An early alignment ran past the end of the school through an underpass, but only sand and broken pavement remain. The travel schedule, thankfully, is a bit empty right now. One trip to California, date and venue pending, the trip to Amarillo in June, and the trip to Chicago in late September are about all. I will have to share a few of the interesting items discovered about Houck, and the man behind the name, Hookers Cut, an auto court that featured stables and garages, and the possible location of the Hyde park Cabins. That, however, is a story for another day.